Anker is a world-class manufacturer of speakers and this discussion will make it pretty clear to you. This time they have designed something that is way heavier and more durable than the rest of its products. Probably they meant it to be like this, as they have been producing small and compact speakers for so long. The Anker SoundCore Sport XL Outdoor Portable Bluetooth Speaker changes the game for them. Many would query, did they miss the market this time? Well, it is for you to understand did they or did they not. We have recorded everything in this Anker SoundCore Sport XL Review, why don’t you take a look and decide for yourself? We certainly think think that is one of the best cheap wireless speakers on the market today! You are looking for a good bluetooth speakers under 100 USD? – Keep reading! The design is trendy and is made good materials that are very durable. It has a metal grill at the front and heavy-duty hard plastic covering the rest of the device. It comes with 5 different buttons on top ( play, power, volume up, down and bluetooth). The battery life of the Anker Soundcore Sport XL is almost 15 hours with a single charge. There is nothing better than living a wire free life and investing in a Bluetooth speaker is one such thing. Nonetheless, the sheer thought of doing all the research on finding out what is the best portable speaker is sending the chills. Nobody wants to waste hours upon hours on Google trying to find all of that information, right? Don’t worry, as we have got you covered and by discussing the Anker SoundCore Sport XL Outdoor Portable Bluetooth Speaker today. Hope this will clarify all the doubts that you may have. As far as the features of this are concerned, we must tell you that Anker does not disappoint you at all. This means there are a lot of things that makes it loveable and we have discussed all that in this segment. So, read on to know more, if this interests you by any chance. Design – It has a rugged look with visible screws, metallic grill and hard plastic as a cover. Nevertheless, has a smooth feeling to it and this makes it different from the rest. Just remember to keep it away from water and that will take of the rest. Sound Quality – You get what is called crisp sound and sublime bass with two subwoofers. The drivers are 2 x 8 Watts apprehend significant frequency to produce quality sound with. In simple words, this is a speaker that can be verily used for modest outdoor meets. Battery – It must be mentioned that it runs on lithium-ion battery of the highest quality. This battery can serve you for 15 long hours and make your evenings sway by. You can charge it anytime and get going. Microphone – It has an in-built microphone that can cancel noise and help you answer your calls. This suggests, you get to answer calls hands free and enjoy your party as well. Find Your The Best Price For The Anker SoundCore Sport Xl Now! – Click Here! Has a flat sound and does not have much of a bass to it. Not the best sound quality. 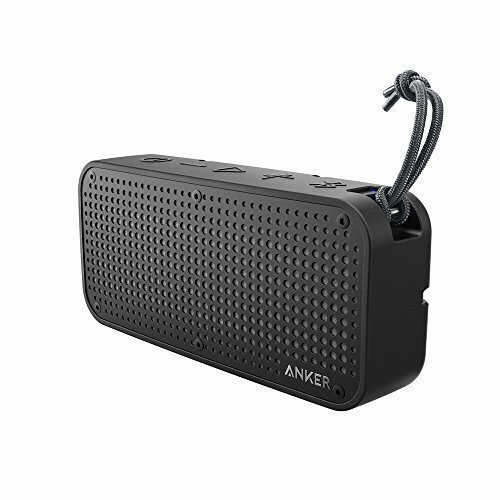 We have already told that the Anker SoundCore Sport XL Outdoor Portable Bluetooth Speaker is fairly priced. This is another that makes it popular over the others. It carries features of a speaker that is otherwise available for $200. However, the ones that you get under $100 are rarely this good. Therefore, I recommend you do not compare this with the expensive ones, but just take it for what it is. A great , low-budget Bluetooth speaker which is a step above the traditional soundcore mini, but without paying 10x as much! And the fact that is the device is waterproof is something we road trippers, backpackers, vanlifers and hikers just love! The one thing that does need consideration is the lack of bass. Thankfully, I am more of a rock person, but if your music genre does include thick and heavy types of bass you might want to consider a more expensive brand. We have tried our best to incorporate all that we could in this review. If you think, we missed out on anything, do let us know through the comments section. The Anker SoundCore Sport XL is a good low-budget Bluetooth speaker. It provides excellent features and is of the best speakers in the under $100 range. Does this mean it is a perfect gadget? No, not really. The bass is minimal and it is a bit bulky compared to its small cousin (SoundCore mini), but if those features do not bother you, it will make your next travel adventures that much more fun! Next articleDon’t Miss The Five Best Family Road Trips of Your Life!